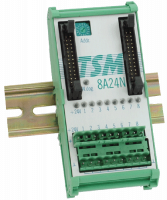 TSM-8A24N is a general purpose digital output module to drive eight valves or relays from an industry standard 24V DC supply. Rated switching current is 500mA over the full temperature range. High side switching allows grounded loads for extra safety. 4mm isolation gap between bus side and load side. At RESET and with missing TSM-Bus supply or missing external 24V supply all outputs are off. Each output has a yellow LED. 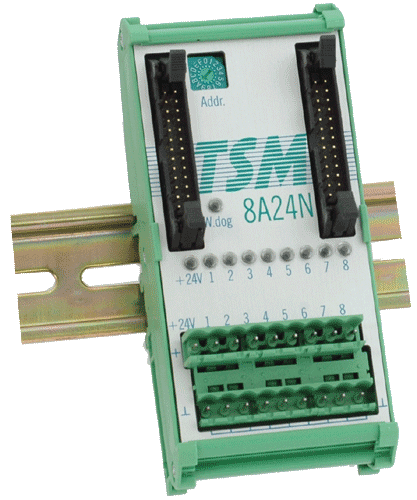 24V DC are wired from the supply to TSM-8A24 and are distributed to the eight loads. 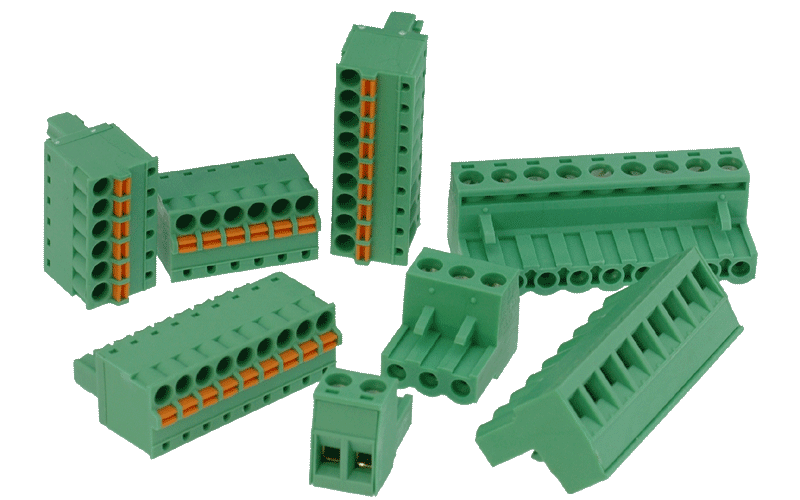 Each output has a screw terminal for output and ground, so valves or relays can be connected without an external wiring area. Outputs are set by writing an eight bit data word to the modules base address. It is necessary to update the output information every 50ms to prevent a RESET from the watchdog circuit. A watchdog situation is signalled by an orange LED and by setting bit 7 on the ID base address. An SRQ interrupt ist generated at the same time. Absence of external voltage (24V) can be read with bit 6 = 1. A green LED signals a present voltage.